Over the weekend the 35th America’s Cup marked a pair of major milestones, with the French being eliminated and the Defender bowing out until the finals two weeks from now after winning the first qualifying round. 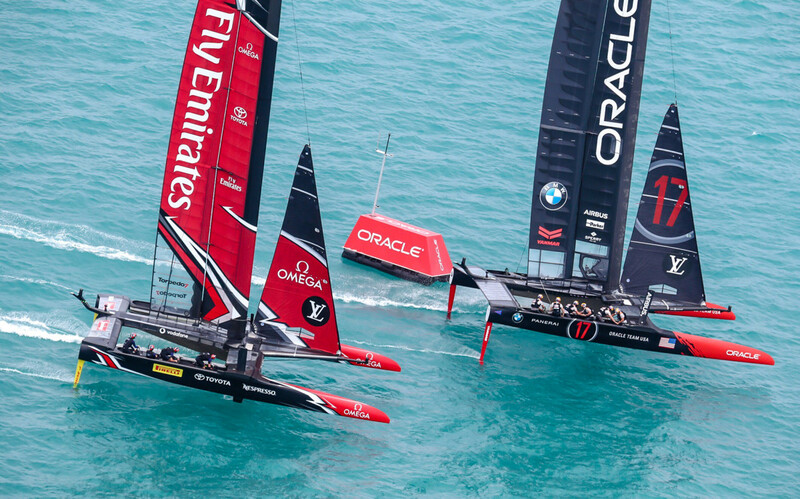 The high point of the weekend was Saturday’s first race between Oracle Team USA and Emirates Team New Zealand. Not only did it serve as yet another grudge match between Oracle and the same outfit it humiliated in the 34th Cup, it may very well have served as a preview of things to come, with ETNZ clearly favored to be the team that vies for the Cup at the end of the challenger series. Regarding the race itself, Oracle won the start and then pretty much led all the way to the finish after that. On the final beat, ETNZ crossed Oracle’s bow when the latter was on port. But then at the next crossing when Oracle once again had the right-of-way, it took ETNZ’s bow and never looked back. As has been the case in past races, the Kiwi’s seemed to have excellent straight-line boatspeed and executed their maneuvers smoothly. However, they also had a tendency to seemingly fall apart tactically whenever the pressure was on—like when they incurred a penalty on the fifth of the seven legs for sailing beyond one of racecourse boundaries. With respect to the rest of the fleet, the final results had Land Rover BAR in third place overall; thanks in large part to the two points it picked up before racing even started thanks to its overall win in the America’s Cup World Series; Sweden’s Artemis in fourth, with 5 wins and 5 losses; Softbank Team Japan in fifth; and France in sixth, which meant that it has now been eliminated from Cup competition, although helmsman Franck Cammas has already vowed to return for the next Cup cycle. Next up is the Challenger Playoffs Semi-Finals in which ETNZ will sail against Land Rover BAR and Artemis will sail against Japan, each in a first-to-five series. The winners of these two matchups will then go head-to-head to determine a final challenger for the America’s Cup itself, which begins June 17. The Semi-Finals were originally scheduled to begin on Sunday, but had to be postponed 24 hours due to lack of wind and will hopefully begin later today. As for Oracle Team USA, for next two weeks, it will get a chance to work on both boatspeed and its maneuvers as much as it pleases. However, while this may sound good, there’s nothing like actual competition to hone your sailing skills, and with all the teams still learning and improving so quickly, you can’t help but think that whoever prevails in the challenger series is going to be tough as nails. Time will tell.